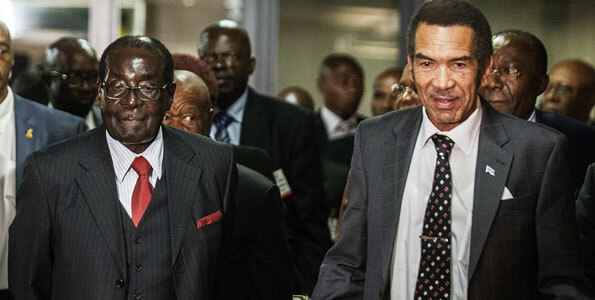 Zimbabwe’s 92-year-old President Robert Mugabe should step aside without delay and allow new leadership of a country whose political and economic implosion since 2000 is dragging down the whole of southern Africa, Botswana President Ian Khama said. Despite his reputation as one of Africa’s most outspoken figures, Khama’s remarks are certain to raise hackles in Harare, where factions of Mugabe’s ruling ZANU-PF party are locked in a bitter struggle to succeed the only leader Zimbabwe has known. “They have got plenty of people there who have got good leadership qualities who could take over,” Khama, the UK-born son of Botswana’s first president, Seretse Khama, and his British wife, Ruth, continued. “It is obvious that at his age and the state Zimbabwe is in, he’s not really able to provide the leadership that could get it out of its predicament,” Mr Khama said, in comments that breach an African diplomatic taboo banning criticism of fellow leaders. Botswana, the world’s largest producer of diamonds, shares 800 km (500 miles) of border with Zimbabwe and has felt the full effects of its neighbour’s economic collapse under the weight of political violence and hyperinflation since 2000. Although the economy stabilised in 2009 with the scrapping of the worthless Zimbabwe dollar, a slump in commodity prices over the last two years has triggered a cash crunch that has fed through into unprecedented public anger at Mugabe. No clear potential successor has emerged from the destabilising factional fight to take over after Mugabe. Khama said the instability was damaging Botswana’s efforts to wean itself off mining – which accounts for 20 per cent of GDP and nearly 60 per cent of exports – by promoting itself as a regional logistics and services hub. The unrest was also forcing more and more Zimbabweans to leave the country, he added. Botswana is home only to an estimated 100,000 Zimbabweans – a fraction of the 3 million believed to be in South Africa – although this is still enough to strain public services in a nation of 2.3 million people. In the latest controversy over his health, Mugabe left a summit of southern African leaders at the end of August without warning and went to Dubai, fuelling rumours he had been taken gravely ill or may even have died. Mugabe frequently refers to himself as “fit as a fiddle” and hints at a desire to stay in power until he is 100. After his Dubai trip, which he attributed to a family matter, Mugabe joked about online reports of his imminent demise. “Yes, I was dead. It’s true I was dead. I resurrected as I always do. Once I get back to my country I am real,” he told reporters at Harare airport. Khama reiterated his government’s concerns about the credibility of the elections Mugabe has won in recent years, but said irrespective of the results no leader should cling on to power for that long. “My opinion has always been that 10 years leading any kind of organisation – not just a country or a government, any organisation – is pretty much the maximum,” he said. During its 50 years since independence, Botswana has emerged as a politically and economically stable nation that has used its mineral wealth prudently – a rarity on a continent where such treasures have been routinely squandered, stolen or the cause of civil war. Khama’s second five-year term in office ends in 2018 when he will hand over to vice-president Mokgweetsi Masisi in a carefully scripted political succession that makes instability almost impossible. After 2018, Khama, a keen nature-lover whose wood-panelled office is adorned with pictures of the African savannah, said he wanted to dedicate his time to tourism and conservation. Thanks to a focus on safari tourism and a zero-tolerance approach to poaching, Botswana boasts more than 150,000 elephants, a third of Africa’s entire population of the animals. But Khama said there was no room for complacency in the fight against the illegal ivory trade given the rampant poaching in other countries on the continent. “One day if their animals become extinct and we still have viable populations, all the guns will be focused on us,” he said.